This article is part of the “Urban Discoveries” series, in which we seek and discover interesting and well designed places to eat and drink around Europe and especially in Vienna. As last time again I worked together with my colleague and dear friend Maximilian Martsch, who is a researcher and works on the topic of food history. The pictures were shot by myself. Thanks to the folks at Bao Bar for the invitation and the nice talk. If you are in search for new restaurants in Vienna, which serve delicious, foreign food beside the usual suspects, Bao Bar might just be the right place for you. Centrally located in Zollergasse right around the corner from Vienna’s busy shopping street Mariahilferstraße, Bao Bar offers high quality Asian street food, conveniently tucked into a steamed bun. Bao, or more correctly Gua Boa is a Taiwanese street specialty, consisting of a soft, steamed wheat bun filled with all kinds of mouth-watering ingredients. Originating in the Chinese province of Fujian, Gua Bao was adopted into Taiwanese culture and ultimately became a staple of the country’s street food scene. Gua Boa had its breakthrough into western mainstream street food culture in North America, where it is still a popular pick among urban foodies ­– naturally, there even is a short Vice documentary on it. 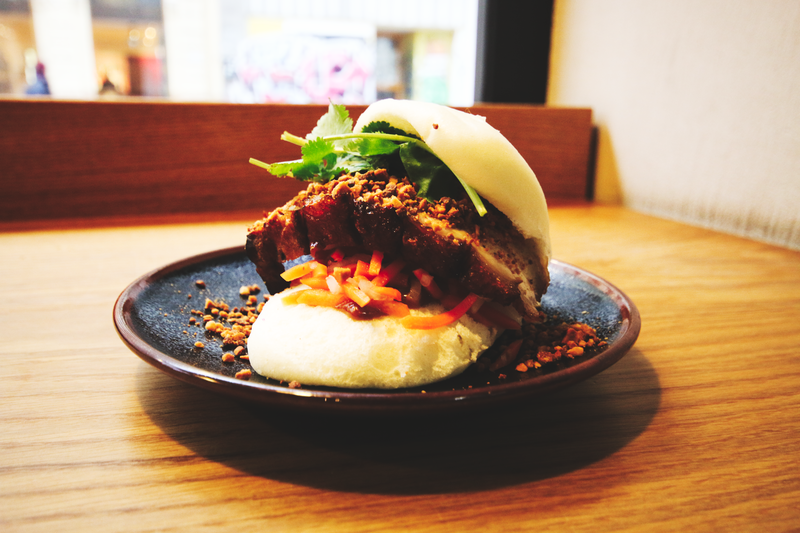 International trends always seem to take some years before they find their way to Vienna, but with Bao Bar you now have the right place to get your hands on this delicious treat. The owner is a young, trained cook who came up with the idea for the restaurant after traveling and obviously eating his way around Southeast Asia. Since one and a half years now, Boa Bar is open for business and is serving its burgers to the hungry Viennese crowd. 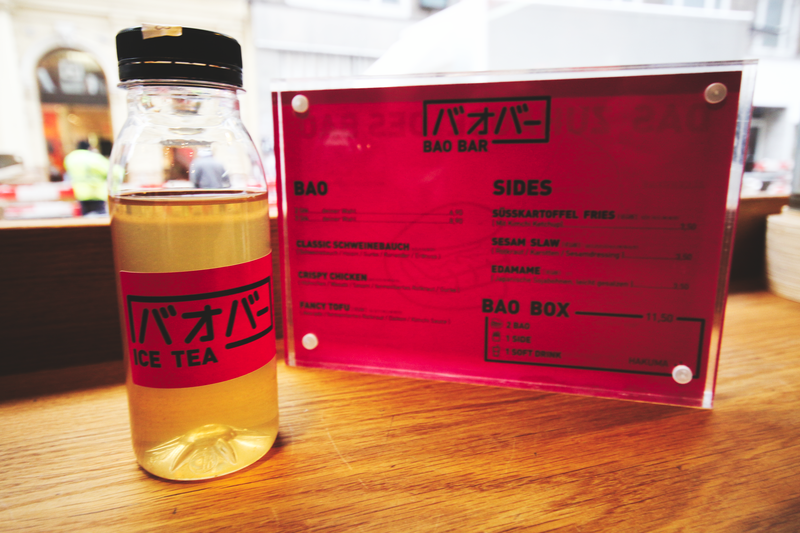 The name already implies that Bao Bar is rather small. The design is inspired by Japanese art and the movie Blade runner. The combination of pink signs, black and white floor tiles, wooden interior, and steel pipes really gives the place a stylish sleek vibe. There are several bar-style seating possibilities at the window and along the wall. The heart of the place is the open kitchen, where you can place your order and watch the skilled personnel swiftly assemble your burger. 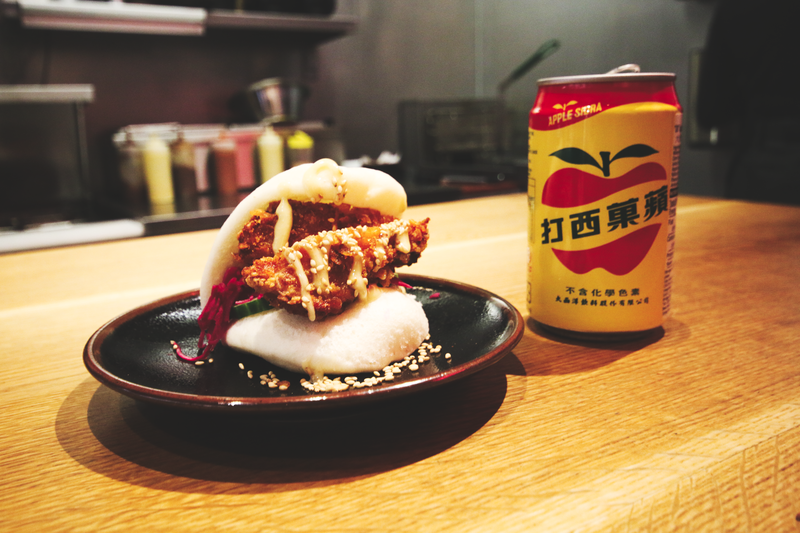 If you go for the menu option (Bao box), you can choose two buns, one side and a soft drink. 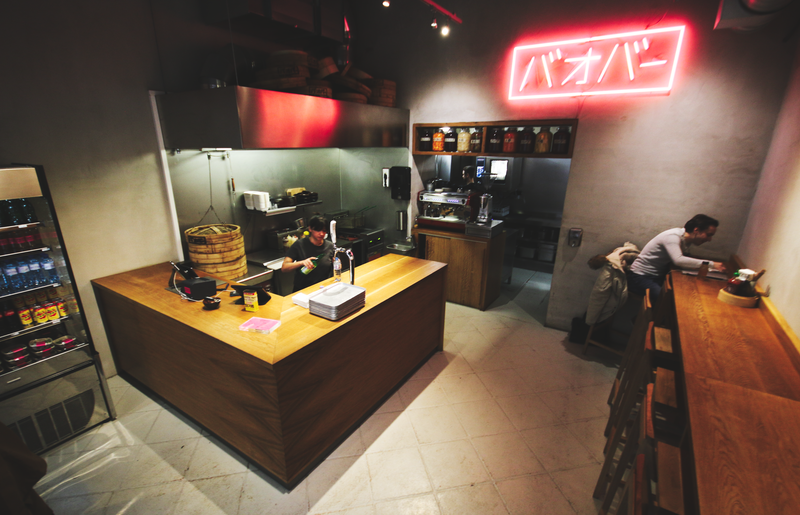 They have crispy sweet potato fries with a nice kimchi ketchup, sesame slaw made of pickled vegetables, and Japanese edamame beans as sides as well as a variety of drinks available, ranging from home-made lapacho ice tea, over Asian beers to Taiwanese soda. If you are in for a special treat, they even have Japanese Kirin beer on tap! Bao Bar offers three burger variations: pork belly, crunchy chicken and a vegan tofu option. All three are accompanied by a selection of pickled, crisp vegetables and rounded off by one of their home-made sauces. The traditional pork belly bao for instance comes with a juicy slice of marinated, red-cooked pork belly, pickled cucumber, house-made hoisin sauce, some fresh cilantro, and ground peanuts. It’s delicious and all the ingredients are high quality. Apart from the meat, which is coming from a small family-run butcher shop in the city, all ingredients are self-made. You can even see the vegetables slowly fermenting in big jars over the counter. The heart of the bao burger, the white, wheat buns are produced fresh every morning in the back before being steamed over boiling water right in front of the costumer. All in all, Bao Bar is just a great place to have a quick bite or to order for take-away. It’s a well thought-through place that offers fresh, high quality fast food. If you don’t have the time to check it out in person, you can also order their food via Foodora, but then you’ll definitely miss out on the great design and lively atmosphere. To find out more about Bao Bar and their opining hours visit: https://www.baobar.at/.